The BIGGEST, easiest-to-read LCD screen on any PDU is the one in your hand. A mobile monitoring solution unique to Server Technology. 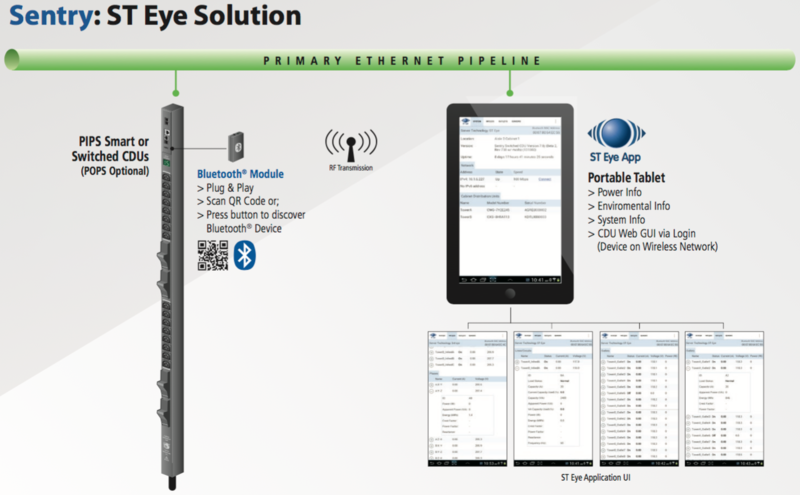 Server Technology Bluetooth App (ST Eye) Remote Power and Environmental Monitoring of STI Rack PDUs from your Android or Apple device. Bring your mobile device to work. The ST Eye mobile application allows you to monitor critical powerandenvironmentaldatadirectlyfromyourAndroidorAppleapp. It’sthefirst Bluetooth® capable PDU technology on the market and the latest innovation from Server Technology. The quickest and easiest way to monitor your PDU at the cabinet level. A Free Android or Apple app allows simple remote access to the PDU’s critical power and environmental information. Power, Environmental & System Information in the palm of your hand. No need to connect to a computer or physically connect to the PDU (either via the network or the serial port) to get information from the PDU when at the cabinet. PDU power and environmental information via simple to use Bluetooth Android or Apple App. Easy access to PDU’s web gui from your mobile device via App and QR Code. Plug-and-Play hardware module enables Bluetooth access. No more struggling with locked cabinets or going into the hot aisle to access the PDUs information. Don’t break a sweat. You can now access your PDU from the cool aisle. The application is a free Android or Apple download.